This year marks the 115th anniversary of the Hamilton Musicians’ Guild which was chartered on April 11 1903. Our founder and first president was George R. Robinson who as many of you know was the bandmaster of the 13th Battalion (RHLI) Military Band and was the man responsible for whipping the band into shape. This December 8th, Local 293 will celebrate our 115th anniversary with an afternoon of music at the Corktown Tavern from 12 noon to 6 pm. Several of our member’s bands will be playing pro bono in support of the Bob Pedler Memorial Fund. The funds raised will go towards helping our sick and disabled members who receive aid from the AFM’s Lester Petrillo Fund. Last year’s event raised over $2000 for the fund. As part of our 2nd annual fundraiser we will again be presenting the George R. Robinson Award which is given to individuals who have distinguished themselves with exemplary support of music in Hamilton with passion and selfless commitment over many years. We will be announcing this year’s honorees in the next issue of the Libretto. Last year’s honorees were Luis Pereira and Linda Fraser, Graham Rockingham and Kevin Barber. Last year’s event was a resounding success with corporate sponsorship and a packed house of enthusiastic Local 293 supporters. We look forward to your continued support to make this a great day for the local and our musicians. It’s a great opportunity to socialize with our peers and celebrate a milestone for the Guild. This past June Brent, Janna and I attended the Canadian Conference in Kingston. We attended two days of officer training which was offered for the second year in a row. The training covered a lot of different ground with topics such as organizing, AFM contracts, the IN Tune Program (our data office system) and grievance scenarios. All of these training sessions were very educational and helpful to officers in their daily office duties. The Conference started on Friday and reports were made by CFM staffers that were basically annual status reports from the various departments of the CFM. Among them were reports from Freelance Services, Symphonic Services, the Standards Committee and the International Representative. All the reports gave us an up to date read on the health of the CFM. One interesting idea discussed was the emerging artist category of membership for younger prospective members just starting out. The idea was to create a special membership category that would encourage younger people to join. The idea was to have lower dues and special showcase fees that would give these artists an entrée into the competitive music scene. At this point, the idea needs to be further developed and beta tested. We will be keeping an eye on this concept to see if it will prove successful. I served on the Standards Committee and the Election Committee while Janna served on the Advocacy Committee and Brent chaired the Diversity Committee. Talks were given by both AFM President Ray Hair and Vice President from Canada Alan Willaert. These talks are always interesting because you gain a broader perspective on the challenges facing our organization. I’m happy to say that their advocacy on our behalf is impressive. The final day of the Conference was topped off by the annual meeting of MROC- our performing rights organization. A financial statement was presented and discussed at length by the officers present. Overall the Conference was a good opportunity to meet with other officers to discuss the issues and challenges we all face and work towards resolving them. Membership of the Hamilton Musicians’ Guild continues to grow and our membership currently stands at 666 active members. Our Executive Board is continually looking a ways to better serve the musicians in our community and have decided to send out a survey in order to get an idea as to possible seminars that we could offer in the future. Survey Monkey is an online service development cloudbased software service that was founded in 1999. Monkey Survey provides free, customizable surveys, as well as a suite of back-end programs that include data analysis, sample selection, bias elimination, and data representation tools. The Musicians’ Rights Organization Canada (MROC) is a Canadian federally Incorporated not-for-profit organization whose primary purpose is to collect and distribute royalties to musicians and vocalists. MROC distributes the performer’s share of neighbouring rights and private copying royalties. These royalties primarily flow from the broadcast and public performance of sound recording and are based on tariffs approved by the Copyright Board of Canada. MROC represents more than 6,500 musicians from session players to featured artists, recording across the full range of genres. The Musicians Pension Fund of Canada – The Plan was established April 9, 1962 as a result of collective bargaining between employers and the American Federation of Musicians. The Plan is registered under the Ontario Pension Benefits Act, 1990 and under the Income Tax Act. The Plan is a multi-jurisdictional plan, the pension legislation of the province in which the Member is employed will apply even though the Plan is registered in Ontario. The Plan is funded through contributions by employers. Employee contributions are not required nor are they permitted. The Hamilton Musicians Guild, Local 293 can help you to obtain a P2 Visa to work in the United States. Would you be interested in learning more about the P2 Visa process? Which time frame would work for your for the workshops? This survey will be multiple choice and should only take a couple of minutes to complete. Please complete the survey when you receive the email to give us an idea of what seminar or seminars that we should schedule. As per Local 293 Bylaws, the term of office for the Local 293 Secretary-Treasurer shall be for a period of three years (Article 10, Section 3) and prior to the nominations, it shall be made known to members that by virtue of election to office of Secretary-Treasurer, they shall also be a delegate to conventions and conferences of the AFM. AFM Bylaws, Article 17, Section 4(a) states that “All Locals of not less than 401 members and not more than 1,500 members shall be entitled to three Delegates. Local 293 Bylaws, Article 9, Section 1 states that “Delegates to the American Federation of Musicians Convention, Canadian Conference of Musicians shall be the President and/or the Secretary-Treasurer by virtue of their office. A third delegate as per AFM Article 17, Section 4 and/or alternate delegates shall be nominated and elected as per the AFM Bylaws. If elected, the third/alternate delegate will be required to pay his/her own expenses unless the Executive Board grants otherwise. Note: The local 293 Executive Board has decided to cover the air travel costs only for a 3rd Delegate to the 2019 AFM Convention & Canadian Conference. Hamilton 2018 Local 293 is pleased to announce that Hamilton, Ontario has been selected as host city of Country Music Week 2018. 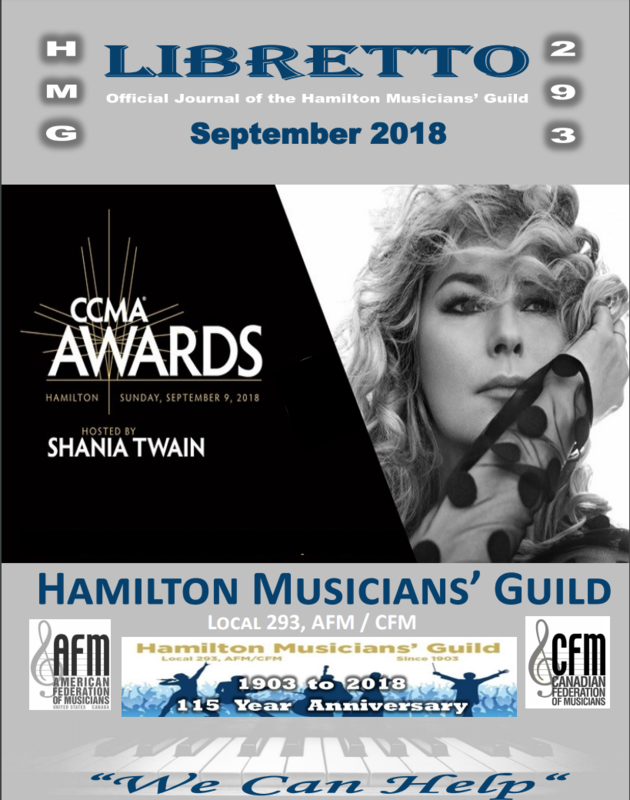 The CCMA Awards Show will be broadcast on CBC on Sunday, September 9, 2018. Canadian country music fans, artists and industry alike, look forward to the CCMA Awards Show every year – Canadian country music’s biggest night. As a salute to the year that’s been, this two-hour celebration features performances and appearances by some of Canada’s brightest country stars and announces winners in eight award categories. Shania Twain hosts this year’s event! I was saddened to hear the passing of Len Lytwyn on July 26th, 2018. I had the pleasure of meeting Len in the summer of 1965 when he was performing with “Dee and the Yeomen” at a dance club in Sauble Beach just north of the Sauble Falls and again in 1967 he was drumming with “The Rockshow of the Yeomen” at the Sauble Beach Pavilion. Len started off in the music business as a rock drummer and enjoyed a successful career performing and recording with many of the top bands in Toronto including “Dee and the Yeomen”. He did admit that his desire to perform as a musician was overtaken by an overriding need to assist musicians when he accepted an offer to be a “Business Agent” with the Toronto Musicians Association (of which he was elected President). Len was later offered the position of “Administrative Assistant” within AFM’s Canadian Office and ultimately the position of Executive Director for Canada in 2004. Len was instrumental in changing the name “Canadian Office of the American Federation of Musicians of the United States and Canada” to the “Canadian Federation of Musicians” (CFM). This not only preserved the historical relationship of Canadian musicians as members of the AFM, but also established them as members of an association with a true Canadian identity. MROC Chairman David Jandrisch said that Len had enriched the lives of many performers in the entertainment world. “Although he endured a series of health issues over the past couple years, he always fought back through each test and setback with amazing courage and will-power. Throughout all these challenges, he continued to serve as a Director (his dedication to MROC being evident in his constant preparation for meetings of the Board) and to participate in his inimitable productive and constructive manner.” He was indeed a good friend to so many professional musicians and entertainers, many of whom never knew of him or met him personally, but all of whom benefitted from his constant efforts to better their musical careers. Janna & I were able to join Ellen Versteeg-Lytwyn, with family & friends, for a fabulous Celebration of Life for Len Lytwyn on August 25, 2018 at the home of Len & Ellen in Keswick, Ontario. Rest in Peace Len Lytwyn, you will be missed my friend. Social media has provided our musicians and artists an entirely new way of reaching their target audience. It’s a wonderful way of expanding a fan base, posting daily activities and itineraries, and generally keeping the band relevant in a very competitive music environment. Inevitably, use of social media has also helped create a unique bond between the musicians themselves, in supporting each other’s shows, as well as sharing resources and information. Social media has also become a place to red flag people and situations which are to be avoided, such as when a member of the musical community has suffered a loss or been defrauded by some less-than-honest person in the business. The case in point is an incident that occurred last year in the Brantford, Ontario, area, when an out-of-province husband and wife team acting as promoters engaged a number of bands/musicians for a concert near that southwestern Ontario city. Unfortunately for the musicians involved, they proved to be unscrupulous and defaulted on all payments and promises. As expected, there was an immediate reaction from the musicians involved, and social media was lit up with the story. Others rallied to the cause, and the word spread to boycott the perpetrators. Nasty emails were also sent to the couple, who responded with threats to sue for libel. The entire region of players seemed to be involved, or at least have an opinion. There was also talk of a fundraiser to compensate the musicians who were shorted. The good news, if that’s possible under these circumstances, was that it united the musical community and inspired them into taking collective action, albeit through Facebook. They realized they must stick together against undesirables such as these and speak as one voice. An injury to one is an injury to all and strength lies with numbers. The bad news is that it was grossly ineffective. Was the gig saved? No. Did the musicians get their money? No. Did the promoters suffer in any way for their actions? No. It was a complete disaster. So what went wrong? The answers are surprisingly simple. Were the musicians involved AFM members? No. Was there a proper contract in place? No. Had the answer to these last two questions been affirmative, the outcome would have been entirely different. As members with a properly executed live engagement contract in place, they would have been able to access the Contract Defence Fund of the jurisdiction’s local. Or, if they were from a different local, they could have gotten help from the Emergency Travel Assistance Programme administered by the Canadian Office. In either case, they would have received at least scale wages for the gig as an advance, and either the local or the CFM would then file a claim against the promoters to secure a judgement for collection of the entire contract. Once the funds were received, the musicians would receive the balance of their fees. The musical community in the region had the right idea—we have to stick together, speak as one voice, an injury to one is an injury to all, and we are stronger together—but they chose the wrong vehicle. While media connectivity is a great way to bring attention to social injustice, the real power to correct that injustice or effect meaningful change starts with AFM membership, and once a member, to making use of all the services available. Let’s talk about that on Facebook. Remember the olden days before the internet and social media? A musician looking for work would walk into the local Musician’s union office and pin a card on the “At Liberty” bulletin board or maybe purchase an ad in the Libretto or International Musician. No need to do that anymore, the At Liberty Facebook Group (HMG293 At Liberty) is online and open to all members of CFM local 293. Feel free to post ads for gigs, find musicians to form a group, to jam with or network. You can discuss trade secrets share experiences, lend advice or post any gear to sell. The group is monitored by the executive board and is open to CFM members only, visit our Facebook page and click on the link to the At Liberty Group, we’ll approve your membership and you’re good to go. Remember to like our page. Being born and raised in Toronto, I was only familiar with Toronto musicians and musicians that I had met playing with American name bands that were playing in Toronto. In 1956 that would change when I met Rick Wilkins and Fred Purser and The Washingtons. In the spring of 1956 my friend, Ed Tighe and myself went to Buffalo on a Saturday to buy a few 78 RPM jazz records at Rab’s Music Store on Main Street. By later afternoon we had cleared Customs and were on our way home to Toronto on the QEW. By 7:00 pm Ed was getting hungry and looking for a place to stop for supper. This is where we spotted a motel with a restaurant called “The Beacon”. As we were enjoying supper Ed said, “Do you see who is coming into the restaurant? They appear to be musicians!” Well he was right, they were musicians and this resulted in my introduction to Fred Purser and The Washingtons. This meant many return visits to “The Beacon” for Ed and myself. Here we met many people and musicians from Hamilton, St. Catharines and Buffalo. Fast forward now to the 60’s. By now The Washingtons were playing at The Innsville Hotel in Winona, Ontario. Both Ed and I were married and my wife, Bette and I were living in Hamilton on the west mountain and keeping in touch with The Washingtons. By now I had my union membership changed to Local 293, Hamilton. A young piano player, Bruce Harvey, who played in the tradition of Bill Evens was very interested in my tunes and started using many of them with The Washingtons. So a close musical connection was developing with the group. Eventually the inevitable happened and Bruce graduated in 1968 and moved to Toronto and was in short order working with the best studio musicians including our old friend Rick Wilkins! The Washingtons started working with a new jazz piano player who took seriously ill. His problem was diagnosed and Fred was told that the piano player would be off for at least 6 months to a year! As a result I received a panic call from Fred Purser asking me if I would like to join the Washingtons! My instant reaction was to say no! This was because I was originally a trombone player and a classically trained piano player. Jazz piano is completely different from classical piano. When I started writing however, I was learning to play jazz piano thanks to my association with Rick Wilkins. When Rick came to Toronto (by now I had written perhaps 250 tunes) he was my first encouragement and still is! Fred, however, would not take no for an answer. I said I can only play jazz piano in a few keys and one of them is not D flat (a favourite key for some black musicians). In D flat you play all the black notes. Fred insisted and said, “We will play in the keys you choose!” Don’t forget that both Bruce Harvey and Rick Wilkins say that you’ll do just fine and it will be a good experience for both of us! Also don’t forget we like your tunes and this will give us an opportunity to play them for a jazz audience. Well Fred was right and the job lasted for 2 years and I was on call for many more. This also led to my taking The Washingtons on the road to play for many Ford Motor Company gigs. This eventually led to the jazz record album “50 Years Together” being made, the only jazz record ever made by Fred Purser and The Washingtons. The recording was completely paid for by the United Church in celebration of the 50th Anniversary of the United Church of Canada and the 25th Anniversary of The Washingtons. The record was well promoted and sold in every “Sam’s” store in Canada! Fortunately, some copies of the record are still available and can be obtained by contacting the Local 293 Office. It helped to introduce Fred and The Washingtons to people all over Canada and many parts of the USA. Of note are some of my tunes, e.g. “Last Train to Wawa”. This album was in the Wawa radio station for many years and also in the 2 radio stations in Sault Ste. Marie, Ont. As well as the U.S. Sault Ste. Marie radio station. Another tune I wrote for Jazz Disc Jockey, China Vallees of Miami, was written for him to use as a theme. This tune was played by China as long as he was on the 50,000 watt station in Miami twice a day! So jazz lovers all over Florida remember The Washingtons! As far as distribution of the recording is concerned, this record had the best, thanks to my good friend Guenther Nolen at Roblin Distributing Ltd in Toronto. Guenther was the manager of Roblin. When he was told about the recording he said, “Don’t worry about distribution, Norm, I will look after that.” One call to Guenther and the record was on its way anywhere in the world! In later years I met people from England, Germany, Japan, France, Australia and other places that were familiar with the Washingtons and the recording. I once asked Fred, “What is your theme song?” He thought for a few seconds and replied, ‘Probably it’s “50 Years Together’ and added “someday we’ll make it!” As you can see they did make it in the year 2000! It was always a pleasure playing with you and The Washingtons. Rest in Peace, Old Friend! Regular Processing: Submit your P2 package to CFM at least 75 calendar days prior to first performance. US Immigration reports a processing backlog for Regular Processing Premium Processing: Submit your P2 package to CFM at least 30 days prior to first performance. NOTE: When you submit a P2 application; you do so at your own risk. AFM does not have control over the decisions U.S. Immigration makes on their processing times. Therefore, USCIS processing times may increase/decrease at any time, without notice. The AFM’s suggested processing timelines are based on an internal weekly, observance of the average turnaround time from submission of application to receipt of approval. Mary-Ann: Mother, Sister, Wife, Daughter, Dear Friend, Musician, Singer, Artist, Band Leader, Confidante, Beautiful Soul, Animal Lover. She was born in Toronto and resided in Orangeville. Mary-Ann was a giving, thoughtful person who also happened to be a wonderful band leader and artist. Always putting others before herself, she ensured that everyone was good to go regardless of what she was dealing with behind the scenes. No false ego. Music was what she was best known for, but as an artist, her pet sketches are stunning and beautifully detailed. I share a personal view, not only as a musician in her band, but as someone who gained an incredible friend. Music brought us together, and her beautiful, giving spirit is what kept us close throughout the years. Mary-Ann never said a bad word about anyone, and that is a gift. To be so kind as to keep any negativity away from all around her, was the way she lived. She, along with drummer/husband Gordie, forged a musical partnership in the mid 80’s, when he came to audition for her cover band, ‘Recoil’. Then, around ’96, ‘Rumours’, their Fleetwood Mac tribute show was launched. It was a seminal catalogue of music, with many players coming from the Hamilton area. With the road trips, we all spent a LOT of windshield time together. There were long conversations about music, people, and life’s philosophy as the cities passed by. She made the travel fun, as we often stole the front seats and made the guys sit in the back. For those many miles…we all talked, laughed, and snoozed as those wheels turned. Every musician that came thru the ‘Rumours’ door knew they could speak freely with Mary-Ann about anything in confidence without judgement. In rock n’ roll, there has been a bit of a stigma regarding women in bands, but I would say that the strength stemmed from her, as did the overall vibe, especially toward myself – being another female in the group. During performances, her conviction to include the whole audience was paramount. She delivered an endearing performance at every show with stories about children, animals, and people close to her. We sure gave her a bit of a ribbing about it – but her heart was always in the right place. As a dedicated musician, Mary-Ann spent her life performing, organizing, and leading shows while raising a wonderful family with whom we all became a part. It was a treat for her and Gordie to bring their two nowgrown children, Kyle and Sarah-Ann, on some road trips with the band. The music world is a smaller and harsher place now that she is gone…and it still seems hard to grasp that she left us here with such short notice. We’ll miss her, this giving soul, and all the fun shows we had out there across North America. I was so lucky to know her, we all were. The 2018 Labour Day Parade & Picnic, organized by the Hamilton District Labour Council, was a great was to see how much of a force organized labour is in our great city. Dozens of local labour groups were present with many of the locals have hundreds of their members family and friends turn out for this years parade. Overall the picnic made for a significant showing and was a great reminder of the siz, diversity and power of our labour force in Hamilton. The event was characterized by colourful diversity with each group showing their unique flags and T-shirts. Many politicians at the parade visited the tent and staging area of the CFM’s Hamilton Musicians’ Guild, Local 293 including Andrea Horwath, Leader of the Provincial NDP Party, Scott Duvall, NDP Federal MP and Hamilton Mayor Fred Eisenburger to name a few. Recently, I sat down with Dani Dada, my loans officer at First Ontario Credit Union. Just after our latest Local meeting at Mills Hardware, I decided to learn more about the Micro Loans for Musicians process.. It has been on offer for months, but I discovered that many union and non-union musicians have not taken advantage of this arrangement. Basically, these micro loans are small loans with easier terms designed to help anyone in Hamilton’s music industry to complete a musical project. The loans can be used for anything; recording, promotion, payments, bookings, etc., etc. A loan can be very beneficial for a group as each member could apply and pool the money. So, if a quartet had $2,500 (the maximum amount for a First Ontario CU micro loan) from each member, the combo could have enough money for a decent recording. Solo musicians could finish a project (my scenario) by having money to pay a company such as Indie Pool for CD/Vinyl pressings, or additional mastering, or promo materials, or to pay for an Album release event. You have to prove that you have a steady income, or positive cash flow, monthly from any source. So, prepare some pay stubs or invoices to show the loan officer. Prepare an approximate evaluation of main living expenses such as, taxes, mortgage/rent, and all that. Remember that Dani says terms are lax for adjudicating. That is, the terms for acceptance and the repayment terms are less formal than for other, larger, loans. The minimum loan is $500 and, as I mentioned, you can apply for up to $2,500. You can have a 2 year option to pay off the loan, or….12 months for $500 to $1,000, 18 months for $1,000 to $1,500, and 24 months for $1,500 to $2,500. The interest rate is 12.99%, which is not bad considering the amounts of the loans and the short repayment time line. There is an option to make monthly payments of $85 for a $2,500 loan over 3 years, as well. All in all, one can see that these micro loan arrangements can be quite flexible. Dani Dada’s main office is in Stoney Creek at 95 Highway 8. However, he made it clear that he would gladly come to the Hamilton office to negotiate a micro loan.